Resurrection out of the Medieval Era is marked by the birth of Italian Renaissance, a cultural and artistic movement that swept across the European continent. This movement was not spurred by major revelations and religious movements. It was brought about by the private wealth amassed by Italian merchants and bankers who had a great interest in using the arts as a way to display their wealth. Chief of these was the Medici Familia. Here, we see the first time in history where private wealth has significant influence on architectural development. The Italian Renaissance marks a return to classical principles of architecture and city planning, previously developed by the Romans and Greeks. It marks the rediscovery of ancient principles, ideas and technology that were lost to Europe for centuries It also makrs the rise of humanism by celebrating rational thought and an observation of the physical world. It was about the 'Enlightenment' of the individual man, turning chaos into rational order. With respect to the built environment, Renaissance design was based on pure forms and proportions - squares, circles, symmetry, balance - in contrast to the seeming chaos of Medieval design. Rational forms were easily understood and were used to help comprehend the proportions of everything from the human body to an entire building. Leonardo di Vinci’s drawing of the Vitruvian Man best depicts this. The Renaissance was also significant in that it was not only used for churches and castles for nobles. It was a style for the “self-made” wealthy class. The Vitruvian Man by Leonardo di Vinci. Depicts an interpretation of the proportions of common man as defined by ancient architect Vitruvius. This drawing Di Dinci is critical to Renaissance Architecture because it represents a renewed interest in ancient ideals such as natural humanism and simple order..
One of the many three part Palazzi ( or palaces in Italian) that arose out of the Renaissance style and abound in Florence. The typical Palazzo consists of a heavy rusticated base ( Piano Terra), a much more refined second floor (commonly called the Piano Nobile) and a rather plain looking third floor (Piano Terzo). This gave the building a dignified sense of order and legibility. Families like the Medici of Florence were patrons of the Renaissance Arts and commissioned numerous projects, paintings and sculptures. In fact, the Renaissance was begun here and the best examples of the style can be found in the Tuscan capital. The Duomo of the Florentine Cathedral is considered to be the very first Renaissance building. To this day it is still the largest self-supporting masonry dome in the world Other notable Renaissance designs are the square of Santissima Annunziata and the Medici Place, both in Florence. 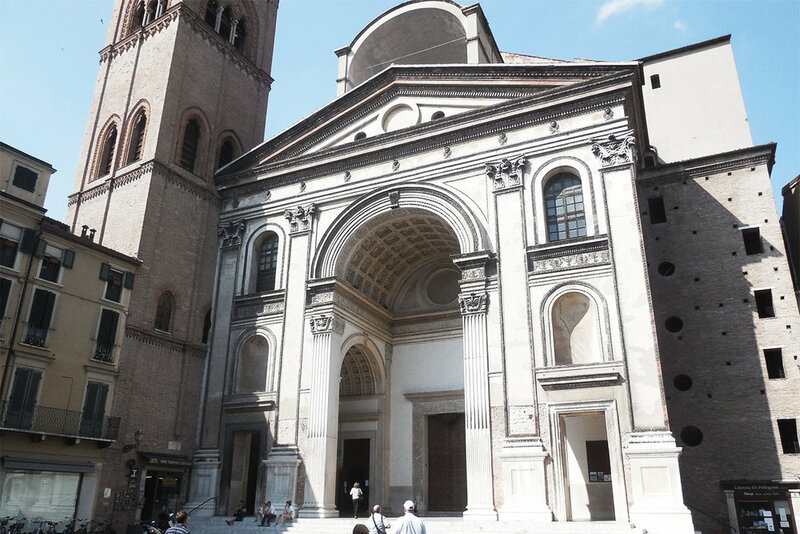 The Church of Sant'Andrea in Mantua, Italy is famous for its influential facade. The Campidoglio in Rome designed by Michelangelo, is one of the world’s great spaces and the church of S.Maria della Consolazione in Todi, Italy is a perfect example of a Renaissance circular plan church. The most influential building from this period is a miniature circular plan temple called 'Il Tempietto'. This small domed structure would serve as a model for the domes of many great buildings in the future: the U.S. Capitol Building, St.Peter’s Basilica in Rome, St.Paul church in London, and countless others. The Tempietto, designed by Baroque architect Donato Bramante, is the ancestor to just about every significant domed building that has come after it including the dome of St. Peter's in Rome, St. Paul's in London, and the US Capitol Building. Front facade of St. Peter's Basilica in Vatican City. Designed by Michelangelo, the church was used as a billboard for the Catholic Church, invoking an emotional appeal to the masses. Church of San Ivo.The drama is built up by the elongated linear space, and the rounded apse entry at the end. San Carlo alle Quatro Fontane in Rome is a Baroque Style Church designed by architect Francesco Borromini. It summarizes what the Baroque Style became at the height of its popularity. even though the church itself is relatively small. Baroque church in Rome, San Andrea della Valle. The Baroque movement immediately followed the Renaissance Movement. Unlike the Renaissance - where its primary supporters and patrons were bankers, merchants, and self-made men - Baroque was developed solely as a propaganda tool for the Catholic Church. The Protestant Reformation, started by Martin Luther, had gained heavy momentum and was a direct threat to the power and influence of the Catholic Church. A counter-reformation movement was begun by the church which called for internal reform and an arts and educational movement with the sole intent of winning people back to Catholicism. The church called this initiative Baroque. The goal was to appeal to the emotions of the faithful through extremely dramatic, elaborate, exaggerated, and theatrical art and architecture. This created a canon of artistic works that looked more like scenes from a dramatic playwright than a buildings and paintings. Facade fronts seemed to jump out at viewers due to the depth and shadows they created. Instead of circles, ovals and ellipses became the popular forms of choice because the uneven axes increased the grandeur of a space. The use of convex and concave curves was also key in creating the desired emotional effects. Intense paintings of religious scenes were also employed to heighten the effect. The ceilings of churches were adorned with the most elaborate and colorful murals of bible stories and chapels contained carefully crafted stone sculptures of angels and saints with such precise detail that they almost seemed real. What Baroque produced was a physical experience that pulled on the emotions and passions of believers. Whereas the Renaissance was built of rationality, Baroque was built on compelling narratives told through art and architecture. It was - and is - a very beautiful style, but perhaps it stirred up the wrong feelings. Or maybe, it wasn’t as effective as it was designed to be. Whatever the case, institutional movements like the Baroque combined with the tyranny of monarchical governments, spurred revolutions across the world and would set the foundations for a new architecture free of propaganda, ornament, meaning, and institutional monumentality. This style of architecture and city planning would arise to be called, 'Modernism'.